The bright façade of the building features attractive stucco elements, which are ornate, playful and ordered at the same time. The period styling continues in the building’s interior, where many classic features are preserved. This contributes to the spirit of the building, that can be felt in every corner. In 2012/13, the pipes and electricity were brought up to date, and new lifts and spacious balconies ensure comfortable, modern living in this classic building. This rented apartment, located on the 2nd floor of this classic Altbau, offers an extra portion of charm and light. With three bright rooms, thanks to the high ceilings and large windows, a balcony to the quiet courtyard garden and a cosy kitchen, which is the secret centre of the apartment, this 74sqm gem offers far more than meets the eye. With its exceptional floorplan and practical layout, the apartment is very popular with a broad tenant clientele. 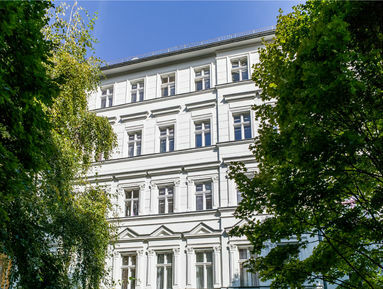 The building lies on a peaceful, tree lined street in the heart of Kreuzberg’s coveted Wrangelkiez. Here, it would be easy to be overwhelmed with all the area has to offer. Within easy walking distance is Gorlitzer Park, with the Spreewaldplatz swimming pool and the chance to play black light mini golf, Treptower Park, with the Soviet War Memorial, and the Spree, with its many water-based attractions. Also within a few minutes’ walk is the U1 underground line, one of the easiest ways to commute from East to West in Berlin. Life is good in the Wrangelkiez!